In March 2008 Melvin Bragg's 'In Our Time' show focussed on the dissolution of the monasteries of Britain in the 16th century by King Henry VIII. Although the monasteries were wealthy and this was something that lead to their downfall, I was struck by how the role of the monasteries was defined: they were there to pray for the nation and the king. There is a parallel here with Japan in the Nara and Heian periods - the two eras which Kūkai's life straddled. Before the dissolution there was probably no place in the UK more than thirty minutes from a monastery. European monasteries had a routine of daily prayers which were always the same, and chanted or sung at the same time every day. They also celebrated saints days and festivals. In the case of Japanese monasteries the chants were Buddhist sūtras, but otherwise the form and function were very similar. Monastery and monk are related to the word mono and all convey the idea of 'singular', an individual or one alone. Clearly the term must have applied originally to hermits or anchorites. Anochorite comes from Greek anakhoretes, lit. "one who has retired." However these days we understand a monk to be someone who lives communally. The term for this is 'cenobite' from the Greek koinobion "life in community, monastery." The traditional terms bhikṣu/bhikkhu are often translated as 'monk', and this works because although bhikkhus were likely to have been anchorites in the very early days, they have mostly been cenobites for many centuries. The word 'nun' by the way comes from an entirely different source - it is a name for a female elder and is related to 'nana' (which is what we called my grand-mothers as kids). I like this image of numerous widespread groups of people whose sole responsibility was praying for the benefit of the nation and the king or queen. Of course this was before the present scientific era, and prayer was a far more prominent approach to dealing with suffering. These days we think that science and technology have suffering beat. There is no doubt that scientific medicine has made a huge difference in our lives - we live longer, survive diseases that might have killed us, and have a more comfortable life generally. However we still grow old, still get sick (in ways that cannot be simply cured by drugs), and we still die. These facts are very much at the heart of the Buddhist definition of suffering, and they haven't changed. Often we feel a greater sense of unease about old-age, sickness and death and I think this is why a rigidly rational approach to life fails to satisfy. Keep in mind here that recent research on the placebo effect has shown that if we believe that prayer helps us recover from illness, then it will help! The idea that a Buddhist monk might have become a monk for the benefit of all beings has not really taken root because it's not obvious how beings benefit from such behaviour. In the current world view it is not clear "what is in it for me" to support monks. Sadly many of us do not take the effects of acts of devotion seriously, despite the evidence. Japanese monks focussed on a small number of Mahāyāna texts which state that anyone who chants the sūtra will gain protection from misfortune for themselves, the nation and the king - for instance the Golden Light Sutra. They took this on face value and set up a network of regional temples for the purpose of chanting there sutras. Another aspect of supporting monks is the accumulation of merit (puñña/puṇya). By acting meritoriously one tried to attain a more fortunate rebirth from which the pursuit of liberation is easier. The role of lay people in Buddhist society often devolves to simply supporting monks. At worst the role of the monks is simply to teach lay people how to follow the rituals about supporting the monks. An example of this is the Sri Lankan bhikkhus who go to India to meet with the Dalits and rather than teaching them the Four Noble Truths, or how to meditate, focus on the correct procedure for bowing to a bhikkhu. 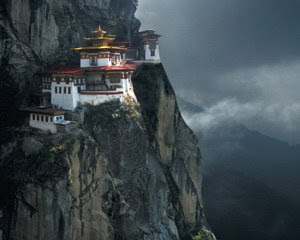 There are now a number of well established Buddhist monasteries in the West. I've not had any direct experience of them - though friends of mine have. ** I think one of the reasons that the FWBO has not yet developed monasteries is that we are not entirely clear what they are for. Long solitary retreats are quite popular, and some longer retreats (particularly the annual three month order retreat at Guhyaloka) are now available. But what role would a monastery play? I know that a number of my colleagues are interested in this question and it will be intriguing to see if we develop a cenobitical lifestyle at part of the FWBO mix. * Holmes, B. "Suffering for your beliefs makes others believe too," New Scientist volume 202 no 2710, 30 May 2006, p.9. On the New Scientists website as "Religions owe their success to suffering matyrs". ** See for instance Jayasiddhi. June at Gampo Abbey.